Chris Plaskon appears in court. Said to have signs of psychosis. Home Scandal and Gossip Chris Plaskon appears in court. Said to have signs of psychosis. What’s in store for Chris Plaskon now? Chris Plaskon, the 16 year old Jonathan Law High school student from Milford, CT, today appeared in court, charged with the murder of fellow student Maren Sanchez Friday week ago week. Whilst the boy turned up to court in shackles, his victim today was laid to rest. The vicious stabbing murder is said to have come as a result of the boy being declined a prom date. Was Maren Sanchez’s boyfriend, Jarrod Butts seen as a threat by Chris Plaskon? During the preliminary hearing, Chris Plaskon showed no visible sign of emotion as he stood next to his attorney, Richard Meehan and uncle Paul Healy who has since been appointed his guardian. 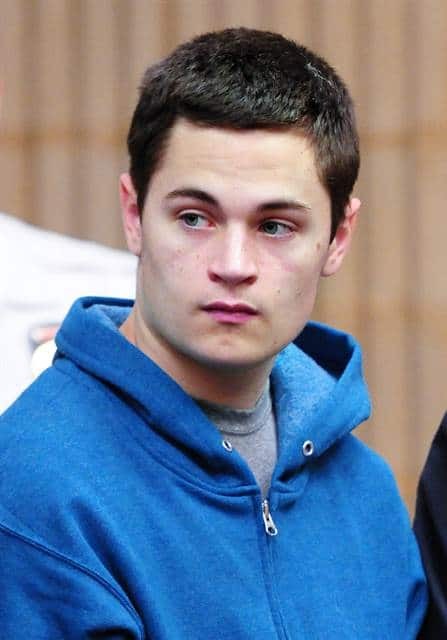 The court ordered that Plaskon be transferred to the state’s Manson Youth Institution in Cheshire where Meehan asked that his client be placed at a hospital under suicide watch. Although not providing intimate details of Plaskon’s condition, he did say that Chris Plaskon was showing signs of psychosis. Meehan said Plaskon’s parents wanted to attend the hearing, but he recommended against it because he believed it would be too difficult. He said they are in seclusion. Since being arraigned this past Tuesday, State attorney Kevin Lawlor decided that Chris Plaskon will be prosecuted as an adult and not in juvenile court. Plaskon will not enter a plea until after a probable cause hearing, which is scheduled for June 4. At present the boy is being held on $3 million bond and faces up to 60 years in jail with a mandatory minimum of 25 years if found guilty of murder.